Only a couple of more articles to go until I have finished this whole series on to customize pitching mechanics and training to a specific pitcher based on their unique profile. If you don’t know about this profile check out the graph below to see what I am talking about. Here are links to the other parts of the profile for you to check out. They are long and in-depth but I’ve been getting some tremendous response to this whole series which to me means that I am onto something big and hopefully it can help out a lot of people. Over all that’s a total of 16 articles and almost 30,000 words and there’s still at least 3 articles to go including this one which will focus on the role that speed-strength plays in the athletic action of pitching a baseball. Speed-Strength is defined as “speed in conditions of strength”. This means that speed is the first priority and strength is secondary. So we will be using a light weight and we are moving it quickly. How fast you ask? In the range of 1.0 to 1.3 m/s if we were to measure bar speed. I’ve spoken before how the pitching delivery from start to finish looks a lot like the force-velocity curve going from left to right. We start at a complete standstill (low velocity) and have to get our entire body (high force) moving and we end with our arm moving very fast (high velocity) with the goal of throwing a baseball (low force) as fast as possible. 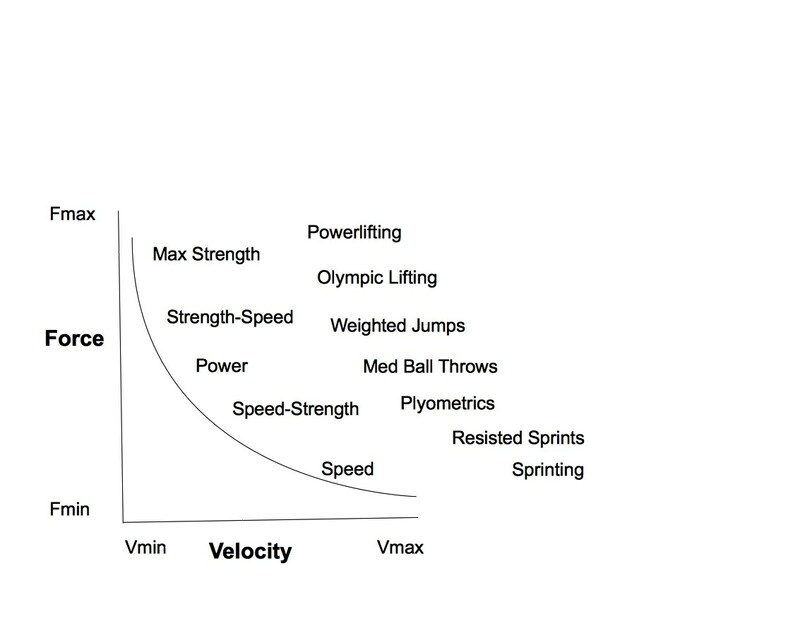 To test a pitchers speed-strength abilities I would like to plead my case for some good old fashion medicine ball throws like we see on the force curve above as an example of what kind of training fits each part of the curve. The fact that we are throwing something is huge since at the end of the day that’s we are doing on the mound which makes it specific to a certain extent. The act of throwing and letting go of the med ball is what allows us to achieve the kinds of speeds that we need in order to hit this part of the curve. In the section on strength-speed I mentioned how when we lift a barbell a good portion of each lift is spent decelerating the bar even if our intent it to accelerate and the weight on the bar is low. Which Type of Medicine Ball Throw Should We Test? 2 – This brings me to point number two, its easy to learn. After a couple of attempts most players will figure out their release point so that it maximizes distance, think launch angle. I have seen a couple of a powerful athletes not score too well due to either pop ups or line drives but given time they figure it out. And if they haven’t figured it out after a couple of weeks you can of this as a skills assessment because if they can’t figure out this release point good luck getting them to throw a breaking ball or change up for a strike. 3 – The scoop throw can be measured in a very objective manner with a simple tape measure. Sure there are plenty of rotational medicine ball throws that are even more specific but they can’t be measured unless you have a really expensive medicine ball with an internal accelerometer. I’ve seen research where radar guns have been used but I know that a lot of radar guns don’t do a great job of picking up slower speeds. Plus not everyone has access to radar gun but a tape measure is pretty easy to get your hands on. 4 – In my thesis the strongest predictor to throwing velocity were the lateral jumps however the next best was the scoop toss. Specifically with right handed subjects and their throwing velocity with a shuffle. When combined with the lateral jump they scored an R2 value of 0.34. Here is a scatter plot of med ball scoop throwing distance and pitching velocity with the College of Central Florida Patriots from 2017 when I was consulting with them. 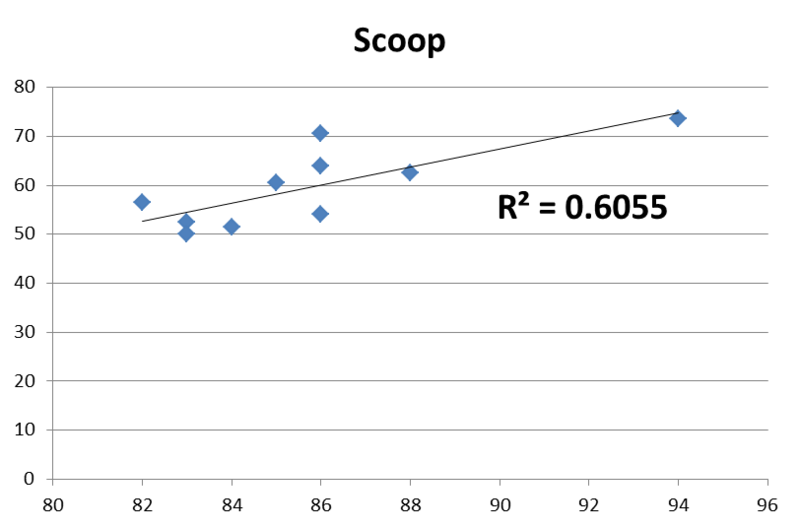 Its a pretty strong correlation here but a couple of things are different from this data compared to the numbers I gathered for my thesis. The first is that this is just the data from the pitchers throwing from a mound whereas the data I had in my thesis had both position players and pitchers throwing from flat ground. This team tested with a 6 lbs med ball and the average throw was just under 60 ft while the mound velocity for this pitching staff was 85.7 mph. But as you can see from the graph there was one big outlier in terms of the throwing velocity and that is Nate Pearson who was only throwing 94 mph here. I say only because he has been known to hit triple digits but this was in the fall of his first and only year at College of Central Florida. He also ranked #1 in med ball throwing distance with a monstrous 73.5 ft throw. Why is it a Strong Predictor? Why does this test do a good job of predicting throwing velocity? I can think of three major factors come into play that I think cause a relativly high correlation for throwing both a 6 pound medicine ball and a 5 ounce baseball. The first is a that both require an athlete to produce high levels of speed-strenght. The other two are body weight and arm length. 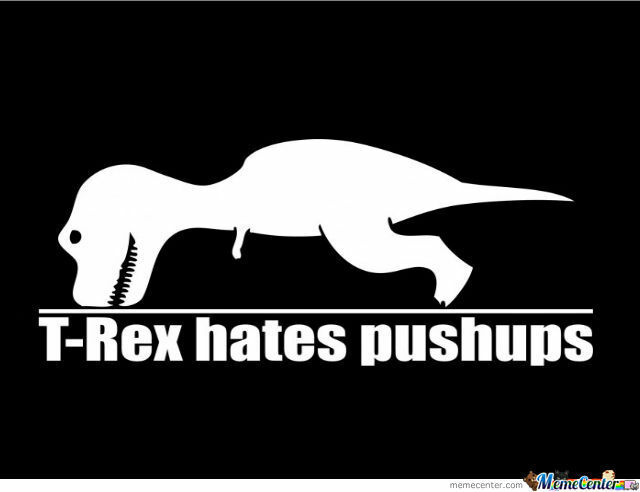 Having longer arms essentially turns you into a human catapult so assuming you have the same level of speed-strength as your T-Rex teammate you should out perform them for this test. Being heavier has almost always been shown in the literature as a strong predictor for throwing velocity in baseball since the name of the game is transferring momentum to the baseball. So more weight means you have the POTENTIAL to transfer more momentum to the ball no matter if it weighs 5 ounces or 6 pounds. Since not everyone is going to be able to throw the med ball very far due to a potential lack in speed-strength, arm length or body weight I wanted to end with an idea of how to test and train with the scoop toss. Find a lighter med ball that you can throw at least 30 ft and stick with it until you can get beyond 60’6″. This distance was selected for obvious reasons. For young athletes use their age appropriate mound distance. Once you’ve accomplished this goal you would then grab the next heaviest med ball and repeat the process. Pretty simple, but not easy. If you’ve made your way all the up a 60’6″ foot with a ten pound ball and you’re still aren’t throwing a baseball from a mound at 90mph or higher then you need to look else where for improvements because you have tapped out what you, as a pitcher, can get from the speed-strength column.